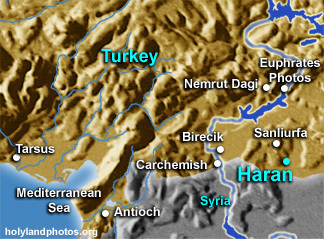 Haran (also Harran) is located 28 mi. [45 km.] south-southeast of Sanliurfa in an open plain area. The name means "cross roads." It was located on the route that led from Nineveh in the east to the ford on the Euphrates River at Carchemish 55 mi. [90 km.] to the west. It is mentioned 11 times in the Old Testament. Abram settled here for a period of time on his way from Ur to the Land of Canaan (Genesis 11 and 12). Isaac's wife Rebecca was from the area. Jacob lived here with Laban for 20 years after fleeing from his brother Esau (Genesis 29). Here he married Leah and Rachel, and all of his children, except Benjamin, were born here! The city is mentioned in cuneiform texts as far back as 2000 B.C. It was a center of the worship of the moon god Sin - who was also worshiped at Ur. It appears frequently in cuneiform documents and was the last capital of the Assyrian Empire until being captured in 609 B.C. by the Babylonians. In 53 B.C. Crassus, a prominent Roman, was killed here and his troops annihilated. In A.D. 217 the Roman emperor Caracalla was murder here. Today about 7000 people live in the village and vicinity.